Dubai, UAE, March 21, 2019: Week 13 of the national show jumping competitions will kick this weekend – on Friday the 22nd and Saturday the 23rd - at the Emirates Heritage Club in Abu Dhabi. The show will be held under the sponsorship of Longines, Official Time Keeper and presenting partner of the Emirates Longines Show Jumping League competitions. 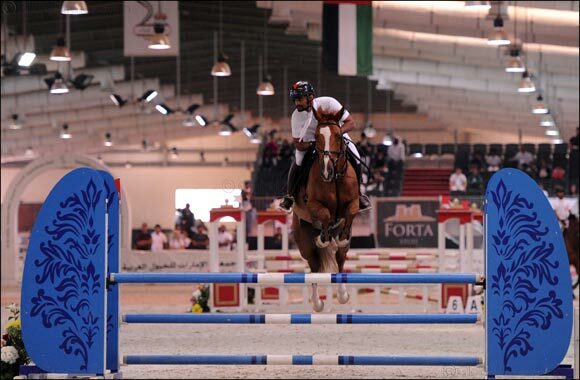 Held in cooperation with the UAE Equestrian and Racing Federation (UAEERF), the two-day show jumping competition will see riders jumping heights of up to 145cm in the club's indoor sand arena. This weekend features 11 action-packed classes - five on Friday and six on Saturday - for riders and horses of all levels. This national includes competitions for Advanced riders (Division 1), Amateurs (Novice Division and Division 2), Juniors (riders between the ages of 14 – 18), Children, and Young Horses (4 – 5 year-olds & 5 – 6 year-olds). Friday's competitions will include: a Special Two Phase for Young Horses (4-5 year-olds), Novices and Children; One Round Against the Clock for Young Horses (5-6 year-olds), Juniors and Division 2 riders; One Round Against the Clock for UAE riders and One Round Against the Clock for Division 1 riders. The remaining competitions will be held on Saturday and consist of two classes of Two Phases and three classes of One Round with Jump-off with the maximum height set at 145cm. There will also be two additional special competitions this weekend - a Fun Class for fathers and sons where they will compete in One Round Against the Clock (on Friday) as well as a competition dedicated to riders who will be jumping spirited Arabian horses (on Saturday). All riders will be competing for their share of a generous prize purse of 700,000 AED. The competitions will be supervised by Hussam Zummit, who represents the UAEERF, with the ground jury headed by Khalil Ibrahim, with assistance from other jury members. International course designer, Volker Smidth, designed this show's course, with the help of other course designers.